When allesTEK engages with you, our goal is to make the network easy for you to use and easy for us to manage. To accomplish this we install the allesTEK software called AMS (AllesTEK Managed Services). Our software is deployed rapidly and quietly without visiting each desktop. Deployment starts by installing the secure AMS client on a single computer within the client's network. This one agent deploys itself throughout the entire network within minutes. The AMS agent will remain hidden from end-users even while performing scheduled tasks. 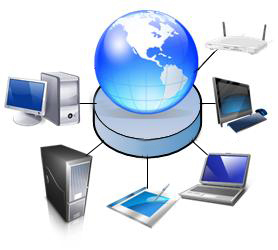 Our AMS agent continually performs checks on the Network, Servers, PCs, and Firewalls. A technician is alerted when a potential issue is discovered in order to take the necessary steps to prevent it from becoming a real problem. Our off-site technicians perform preventive maintenance tasks such as deploying software updates, windows updates, anti-virus updates, patches, spyware removal, server and machine clean-up and much more to keep your network at its optimal performance level. In the event an end user encounters a problem, he or she calls or uses the online portal to create a ticket. Then, a technician assists the user over the phone to resolve the issue. In some cases, the technician may take remote control of the machine for a direct resolution. We have found that approximately 93% of all issues can be solved remotely. When the issue is determined to be unsuitable for a remote resolution (such as hardware failure), allesTEK dispatches a technician to your location for further troubleshooting. The AMS agent is included in the monthly contracted services. It is also available to non-contracted clients for an additional fee.